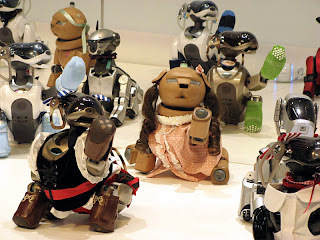 A Rinkya Blog: Aibo Party in Japan! Sony discontinued Aibos in 2006, but the love of the little robot dog still thrives. On January 13th, Aibo fans and owners gathered for Aibo Party. They played games, tournaments, danced etc. The Sony Rolly also made an appearance alongside Aibo. For more pictures of the events, please read here.